2) Is the village crowded with tourists in the summer? Uniquely, St. Cirq Lapopie has no hotels in the village (just several vacation rental houses, a couple of small B&Bs and one large one) so visitors typically come for a stroll, some sightseeing, and a meal, and then are off to their next destination. Also, the village is just enough off the beaten track that visitors tend to come later in the morning and most have moved on by late afternoon, which means even in August there is plenty of quiet and solitude. Living in the village is very, very different than just strolling through it. However, visitors are also a great pleasure-- they come from all over the world, they keep the restaurants and shops open and lively, and sometimes even good friendships arise. But when you live in the village (even if just for a week), you come to feel a bit like a host, proud to be living there, enjoying the wonder in people's eyes, yet also having your mornings and evenings all to yourself and your friends, old and new. And whether in April or August, July or October, you can hike the hills, bike along the river, or just wander the valley, still marveling at what a relatively undiscovered region of France this is. 3) What are the best months to visit? I know we'll sound like a travel agency here, but our family has spent time at the house during every part of the season: the village is beautiful year-round, but the weather is quite temperate and lovely from about mid-April to the end of October. Our family has spent the most time there in August, and we loved it, the weather, the liveliness, the sunsets, the beach (more on that below). Temperatures are rarely too cold or too hot during most of the 7 month season-- naturally brisker in April and October (we've spent lovely weeks during those months too), always a good time for a walk, or to bicycle, or to catch a sunset with a glass of wine. You can get rainy days in the spring (that's what makes the valley green) and you can get chilly nights in October (that's why there's a great stone fireplace), but the beauty and excitement are constant. 4) The house looks big. What's it like for just two people? As you can imagine, the village can be friendly, intimate, and romantic-- great for families and friends, but great for lovers too. The house has a similar vibe. The main floor has a loft-like ambience-- open, light, comfortable-- easy to move around, and easy to find intimate places, by the fireplace, at the kitchen counter, on the leather chesterfields, by the sun-lit arch windows. You won't feel like you're in a cathedral or servant-run chateau. It's your house, a roomy but cozy light-filled place for two. Then up one flight and the entire floor consists of the master bedroom (with a vintage tub for two), a full bathroom, and a lounge (for early morning reading, or watching a movie at night), room for privacy and togetherness, all yours. 5) Are the house and village safe and family-friendly? You're right-- nearly every vacation rental in Europe has a pool-- beautiful houses, out in the country, all very similar, whether in France, Italy, Spain, or wherever. We love that kind of vacation, and we don't mind hopping in the car to imbibe a bit of local culture. 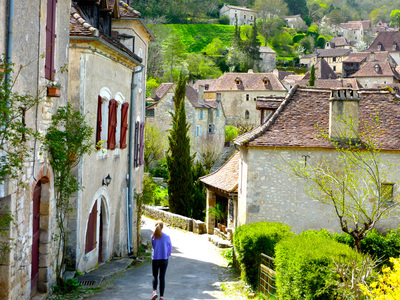 But we're talking about something very special here: actually living in a beautiful French village, walking for your favorite croissants, for a glass of wine, or to visit artist galleries or talk with the friendly local citizens, artists, and worldly ex-patriates who live there. You may decide to use the car, driving scenic roads to neighboring markets, to prehistoric caves, ancient castles, local vineyards. But you'll also know, every step of the way, that you are not only in France, but in one of the most beautiful regions in the world. By the way, we do have a swimming 'pool', about 200x500 meters, with an actual lifeguard, refreshingly clean water, and a sandy beach, just a 10 minute walk from the house: it's the river, an easily accessible and calm part, perfect for playful children and serious swimmers alike. 7) Do we need a car in the village? 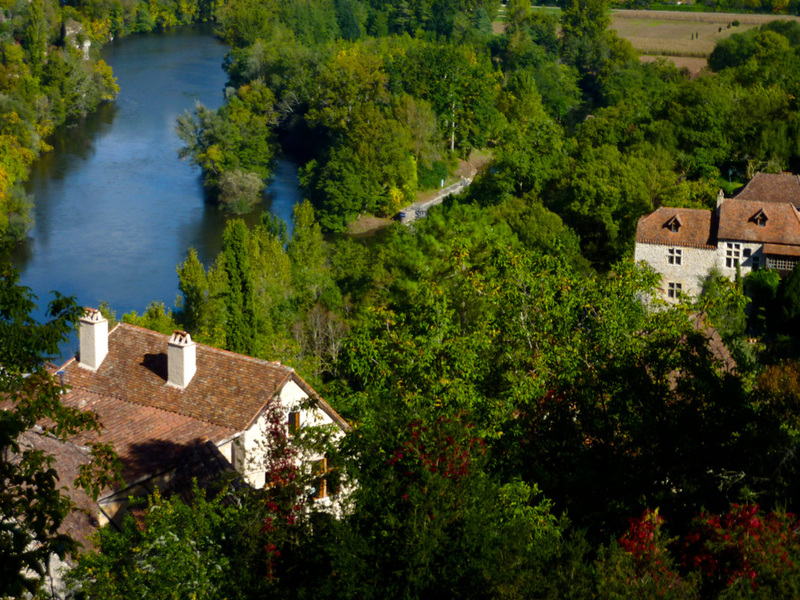 We recently had guests who took a train to Cahors, then a bus from Cahors to Tour de Faure (near the village), and spent their entire vacation carefree and car-free. They walked to local sites, like the Ceneviere castle and restaurants in Bouzies, and they did not run out of things to do in and around the village. On the couple occasions that they needed a car, they hired the local taxi guy, who was very responsive and reasonably priced. And Maxime rents very good bikes, including electric ones,. If you don't drive, or you don't like cars, or you just prefer walking (and some public transportation), and you're a bit adventurous, it turns out you can have a great vacation here. is there stuff for us all to do? If you're a couch-potato, you're all set-- the house has comfortable couches and chairs, a fully-equipped kitchen (and automatic espresso machine), and you can gaze out the windows for great views and a bit of sunshine; and if you feel like moving, you can plop down at the stone table in the public garden just out back, or wander about 75 steps to your own private terrace with chairs. However, the best croissants are a couple blocks away, so that might pose a problem-- but the athletic-types can run out and bring back the pastries… five minutes tops. If you're athletic you have it even easier: climbing the beautiful hills, walking beneath the cliffs, biking for miles in the valley, canoeing up and down the river, a 90 minute trek to a grand castle, etc. And there are opportunities for various sports (will you have the time? ), including several golf courses within a 30 minute drive.